"Our vision... is to develop the IPM PIPE to help maximize economic returns, and improve social welfare and environmental health by promotion of efficient and coordinated IPM decision support systems." VHI is a proxy characterizing vegetation health by combining moisture and thermal conditions. If the indices are below 40 indicating different level of vegetation stress, losses of crop and pasture production might be expected; if the indices above 60 (favorable condition) plentiful production might be expected. VH (VHI, VCI, TCI) is very useful for an advanced prediction of crop losses. September 5, 2013 - Final bulbing stages continue to develop normally in seeded onions as the crop matures throughout the onion regions in the state. Forecast for above normal moisture during early to mid-September warrants an aggressive fungicide program prior to cropping. July 24, 2013 - The spring sown-crop onion crop is now at growth stages 8-10 and harvest season is near its end. Bulb yields and quality have been good as environmental conditions have been ideal. Temperatures have been unseasonably cool (mid to high 80s) and chances of precipitation have increased. The monsoon season has begun and recent precipitation may delay harvest slightly in some areas. Thrips populations in the remaining sentinel plot ranged from 0 to 80 per plant with a mean of 14. This will be the final report from New Mexico for this year. October 4, 2013 - Most fields in Utah have been harvested. A few growers still have some windrowed onions in the field waiting to be harvested with completion of the 2013 year expected by 14 October. September 9, 2013 - Onion harvest has started in the south Columbia Basin. Crops are 2-3 weeks early in maturation because of hot/dry weather in July and August. A major storm in early September, with significant precipitation, has raised concerns about storage rot risks given the late stage of maturity of most bulb crops. Leafminer injury has been very prevalent. 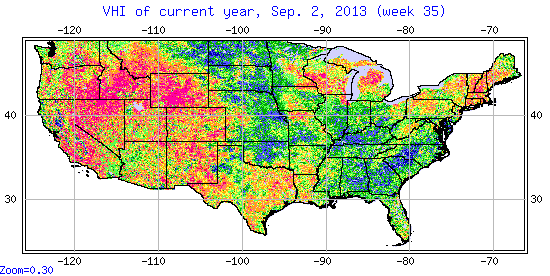 Pink root has been quite severe and widespread across the Basin this season, enhanced by the heat stress. September 6, 2013 - Onion crop development is normal, mostly Stage 9 and 10. Most of the fields have >70% tops down and foliage drying out. The latest sampling and observations were taken in only two sentinel plots, since the other two were in a dry-down stage. September 6, 2013 - Onion harvest continues and yield from early maturing cultivars have been better than expected. Weather has been relatively normal with highs in the upper 60s and 70s and typical to below normal rainfall. Thrips populations have decreased in the past week. Most growers have finished applying insecticides and fungicides. Although IYSV is present in many fields, the number of symptomatic plants is very low overall and typically concentrated along field edges. There have been some exceptions to this in western NY. Botrytis leaf blight and purple blotch are common, but continue at low levels. Bacterial disease is present in fields, but so far does not seem to have been common enough to be a big problem. Training Includes Powerpoint presentations and other materials for use in learning more about the IPM PIPE.